Most of us have probably only ever used cornflour (or corn starch as our US bretheren would have it) as a thickener during cooking, it's got a lot more to it than that. For one thing, baby powder's made of the stuff, and one of the oldest tricks in the book is to use a bit of either one to degrease hair when a shower's just not an option.Photo by J. Squires. If you've got a nasty grease stain, cornflour can get rid of it by soaking up all the grease, pulling it out of the stained material. It can get rid of odors in much the same way, too. Cornflour feels so funny on our skin because it's so fine, but that's what makes it so absorbent. It also means it can get inside cracks and textures that we normally wouldn't be able to clean very well. Furniture is a good example, as cornflour can get rid of the residue leftover after polishing it (or in the case of dinner tables, that pizza grease that won't seem to come off). Because it's non-abrasive, it's also great for glass. Mixing equal parts cornflour and soap in water can make a pretty good window cleaner. Check out the link below for more, and let us know in the comments if you've got some clever cornflour uses of your own. 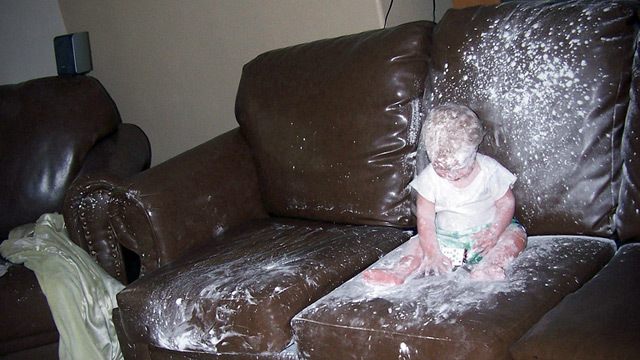 I see Charlie Sheen started at a very young age.